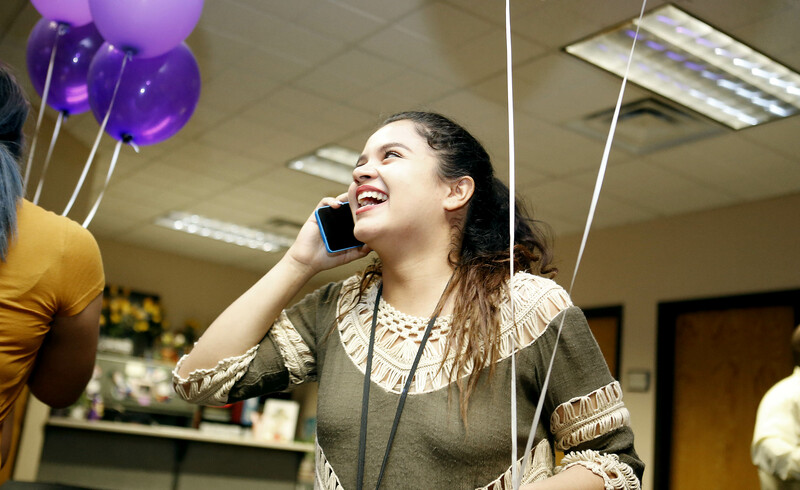 Maryvale High School senior Dulce Alvarez Sanchez shares the good news about her full-tuition GCU scholarship. Seraphine Aziza, a senior at Betty Fairfax High School, was the first on Monday morning. Ninety-nine more will follow this week. 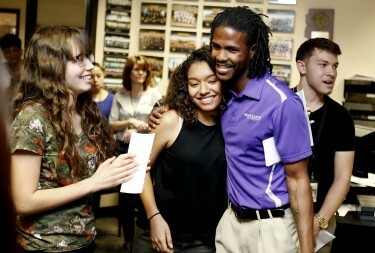 GCU Admissions Rep Kyle Speed gives scholarship recipient Osmara Oregon Pano a congratulatory hug. 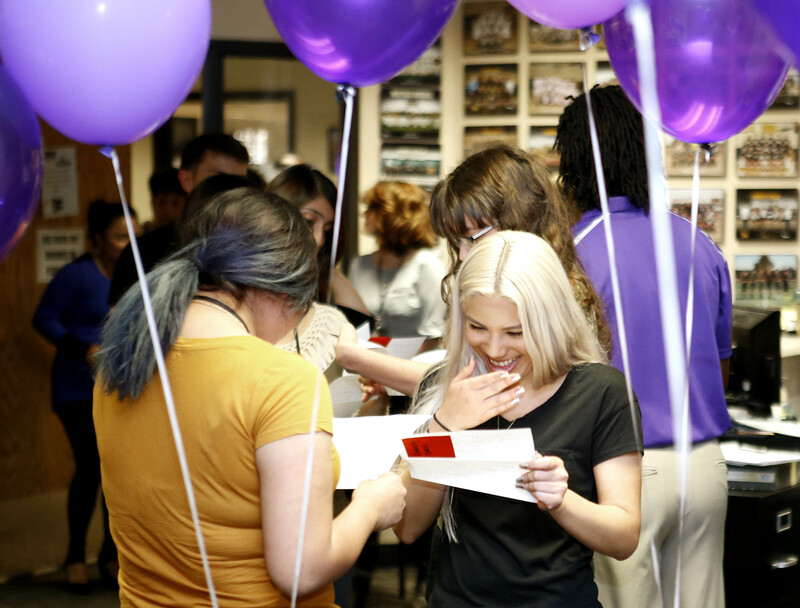 They are the 100 high school students who are receiving full-tuition scholarships to Grand Canyon University as part of a groundbreaking Students Inspiring Students pay-it-forward initiative to improve K-12 education. The initiative is a collaboration of GCU, the GCU Scholarship Foundation, schools and business and philanthropic leaders. But at its core, it’s about students helping students and the impact it can have in inner-city schools in Arizona. The 100 students all received academic assistance while in high school at GCU’s Learning Lounge, a free after-school tutoring program designed to improve the skills and confidence of both under-performing students and those taking advanced-level classes. Those 100 scholarship recipients will pay it forward as college students by providing 100 hours per year of mentoring and academic support at a Learning Lounge site to assist the next group of high school students behind them. Dulce Alvarez Sanchez, left, and fellow senior Kimberly Saavedra get hugs after receiving full-tuition GCU scholarships. 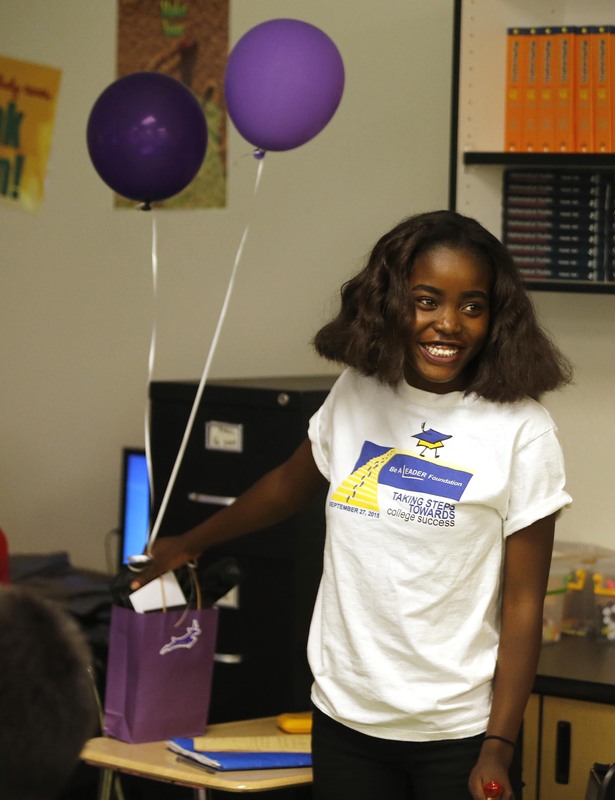 Aziza was surprised when GCU admissions rep Ashley Hardwick and other University officials walked into her 9 a.m. classroom, purple balloons in hand, to give her the good news. A few hours later at Maryvale High School, eight students were called into an office and handed a document by GCU admissions rep Kyle Speed. The reading of that document was followed quickly by smiles, hugs, calls to parents and many “Lopes Up” gestures from the University’s newest group of students. Seraphine Aziza, a senior at Betty Fairfax High School, is all smiles after receiving a full-tuition GCU scholarship. Over the next three days, 10 more inner-city schools will be visited with full-tuition scholarships in hand – Bourgade Catholic, North High, Carl Hayden, Alhambra, Franklin Police & Fire High, Central, Washington, Glenview Prep, Bioscience High and Metro Tech High. Students Inspiring Students is an expansion of GCU’s three-year-old Learning Lounge project with nearby Alhambra High School, which has had remarkable results. Alhambra, located in a diverse neighborhood filled with refugees from around the world, is a school where more than 40 languages are spoken and more than 90 percent of students fall below the federal poverty level. When the Learning Lounge opened three years ago, Alhambra was rated a “D” school by the Arizona Department of Education based on the Arizona Instrument to Measure Standards (AIMS). Most recently, Alhambra was nine points away from becoming a “B” school. What’s more, the number of high school graduates at Alhambra increased from 417 in 2013-14 to 536 in 2014-15; Alhambra seniors earned $2.7 million in college scholarships in 2014-15, up from $1.2 million in 2013-14; and the number of students taking advanced placement exams jumped from 174 to 302. Kimberly Saavedra, left, and Kimberly Garces can barely suppress their delight at receiving full-tuition GCU scholarships.